Dala Large Crack Base is a decoupage medium that enables you to create beautiful, large, antique crackle effects. This product is to be used in conjunction (as an undercoat) with Dala Crackle Glaze for best results. 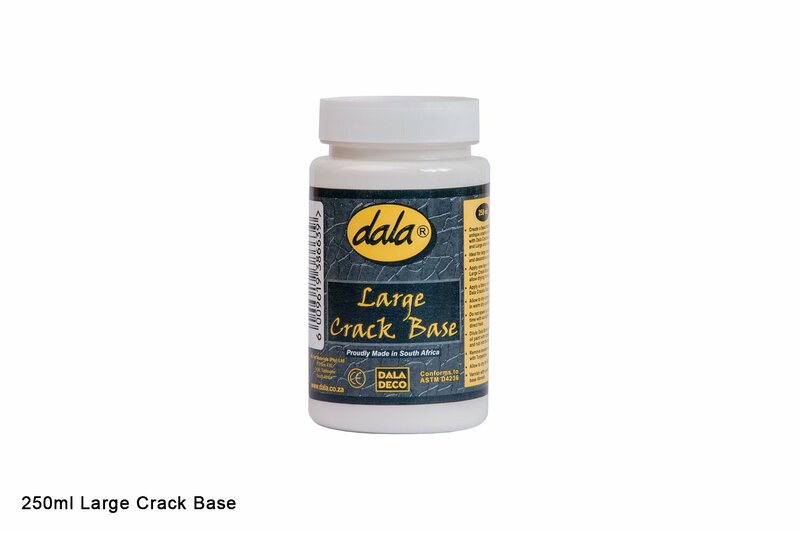 Apply a layer of Dala 'Large Crack Base' and allow to dry thoroughly. Apply a liberal layer of Dala 'Crackle Glaze', and allow to dry for 24 hours. Do not try to speed up drying time with direct heat or sunlight. Once the Crackle Glaze is dry, dilute Dala Oil Paint (in a shade like 'Burnt Umber') with turpentine and work it into the cracks. Remove any excess oil paint with turpentine and seal the crackle effect with a solvent based varnish. This item has 871 views.